Bulldog Selective Rack Systems are designed for maximum efficiency in your warehouse and distribution operations. Our systems provide cost effective solutions to meet your specific needs and are designed for rapid return on your investment. High-quality rack systems are always in compliance with RMI, AISI and AISC specifications and are manufactured from American-made, top grade, high strength cold-rolled steel. Step beams easily adjust on 3" increments (Keystone) or 2" increments (Tear Drop). Beams lock into place preventing uplifting and dislodging when load is retrieved. Bulldog Racks assemble quickly and tightly with boltless beam connections. Upright capacities listed are based on 48" vertical beam spacing. 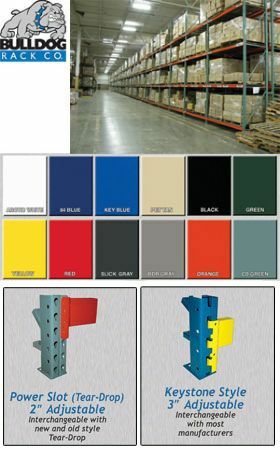 Contact the factory for upright capacities for different vertical spacing. Our powder coat system is the industry's most durable, high-gloss finish. Colors available - Arctic White, Blue, Key Blue, Pet Tan, Black, Green, Yellow, Red, Slick Gray, BDR Gray, Orange and CD Green - please specify. FOB Shipping Point. D x H Capacity (lbs.) Wt. (lbs.) Price Ea. W x H Capacity (lbs.) Wt. (lbs.) Price Ea. Product No. Size Depth Wt. (lbs.) Price Ea.